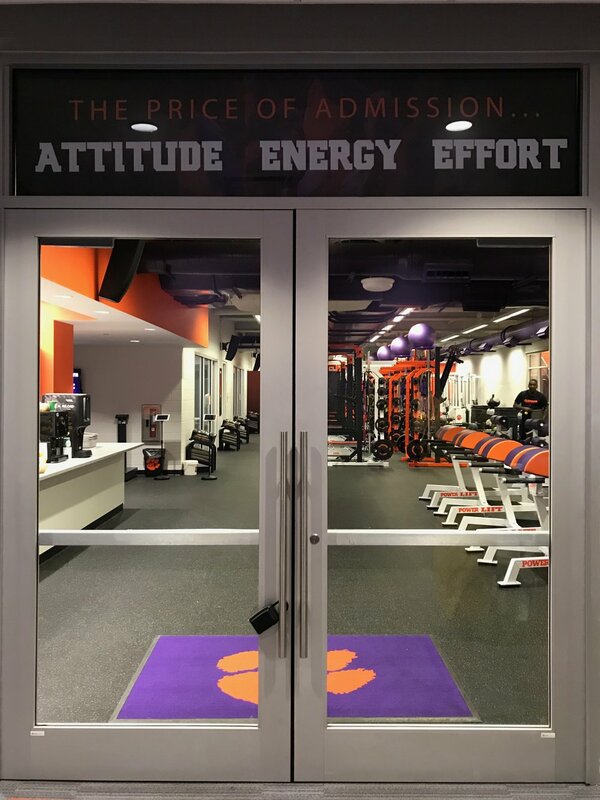 The doors to Clemson’s strength and conditioning facility, where Kaitlyn Cunningham, MS, CSCS, SCCC, works with the women’s basketball team. Within Clemson Basketball Strength & Conditioning, we look at four dimensions of athlete development. I’ll discuss the other three at another time, but for now, let’s focus on the most integral building block: the mental/cultural component. Attitude—willing to learn and take constructive feedback. Energy—consistent support for one another. Effort—mental measure of how much ability you use. Accountable—take 100% ownership in your job. Responsible—accept the consequences of your actions. Dependable—do your job without excuse. Our athletes know all of these and can recite them as stated above. These two layers are to bring out the best version of our student-athletes. As we lay the foundation and build upon that, we begin to see the installation of trust, loyalty, and commitment—the women’s basketball culture. Coach Cunningham’s “Make an Investment” piggy bank. As a continuation of fostering this culture, we passed around a piggy bank amongst the student-athletes. The first day, at the end of the session, I chose whom I believed earned the piggy bank for making a positive investment into their development and the team’s culture during that particular training session. From that point forward, it was a peer-to-peer award. I had the right of refusal if I felt the recipient should not be awarded the piggy bank for that day, and we were clear that this was not to become a popularity event or a pity party for the student-athlete(s) who were not receiving the award. During the course of six weeks, I never had to override a player decision. Typically, leadership is not something that is taught to student-athletes prior to their arrival on a college campus. To build leadership amongst our team and teach student-athletes how to lead—both themselves and their teammates—we used squad leaders. A squad leader is an individual from the team which is responsible for all the team does regarding strength and conditioning for the week they are assigned this position. The first week, I assigned a student-athlete as the squad leader. They reported to me prior to the beginning of each activity to be given all instructions and duties. For example, if Monday is a lift, the squad leader comes to me a minimum of 10 minutes prior to the start time. I give them the warm-up (so they can lead the team through it), any specific instructions or modifications to be given to the team regarding the lift, and any other tidbits of information I needed them to relay to the group. Throughout any and all sessions, I am continually speaking with the squad leader regarding my observations, teammates’ behavior (good and bad), and helping to guide them through any questions they have. Immediately following the completion of each session, the squad leader receives feedback from their teammates and me. This feedback is all-encompassing, with both positive and constructive feedback. At week's end, that student-athlete has the opportunity to pick another teammate that they would like to be the squad leader for the coming week and offer one piece of advice to help them. As Willink and Babin stated in Extreme Ownership, “There is no such thing as bad teams, only bad leaders.” Through the “Make an Investment” installments and development of squad leaders, we strived to develop better leadership amongst our team. By putting the student-athletes in positions to lead and receive constructive feedback, we saw immediate results, and now it gets to show in-season. One of our senior starting guards spent a week as a squad leader. At the end of the week, she chose as her successor a teammate that she believed needed to be put in that position to get uncomfortable and continue to grow. This student-athlete was very skilled on the court and contributed greatly to our team’s success last season, but she also had a tendency to let her emotions get the best of her, displayed poor body language, and showed immaturity. I can honestly say this: As a coach, I feared that coming week with her as the squad leader. She proved me wrong. She was by no means perfect, but she was solid as our squad leader that week. Looking back through my notes, it’s clear that she took being the squad leader more seriously than her teammates believed she would. Even I was surprised. She built confidence in leading the team. We saw a significant change in her body language through the feedback from her teammates that if she would lead by example and show she cared deeply about what she was doing, then others would do the same. It is of little surprise that there has been a carryover effect onto the court this season. In an incredible comeback against Monmouth, she scored a few critical points that helped us get the win. Her body language on the court is still a work in progress, but she has made positive strides there, as well. A clearly-defined culture has allowed for all involved in the program to commit to the same core values. In a continued effort to build upon this proven success, we will continue to educate student-athletes on this mental/cultural component.